A Benedictine monk of St. Meinrad Archabbey, Father Cyril Vrablic, always began his homilies with the following quip, “Someday, I’m going to write a book. I haven’t written any of the pages yet, but I do have a title and some of the chapters.” He would then list off the title and chapters of his mythical book. One title I can still remember some twenty years after first hearing it: “Saints in heaven have all the glory; saints on earth, that’s a different story.” This title got a lot of laughs because of its simple truth: While we admire people of great sanctity once they are no longer around, they can get on our nerves while they still live among us. Jesus, Scriptures tell us, could work no miracles in his hometown because of the lack of faith he encountered among them. When he arose to preach in his local synagogue, the local folks saw only the carpenter’s son. They were impressed by his eloquence, but his other claims enraged them to the point that they wanted to kill him. Only then did he work a miracle of sorts, passing through their midst and leaving town. Where Father Cyril preached, there was a large image of Christ the Teacher. This image of Jesus appears lofty, severe, and royal. It is hardly the image of Jesus that most of us would have living in the twenty-first century. Since Vatican II, Jesus is most often presented—to both children and adults—as our friend. Jesus called his disciples friends (see John 15:13–15); they called him “Lord” and “Master.” I wonder if this isn’t what we ought to be doing. There is something about making Jesus our “friend” that seems to rob him of his divinity and robs us of the power of his presence. We tend to compartmentalize our friends. When we need something, we tend to go to the friend that is most likely to be able to help us. By making Jesus our “friend,” the tendency would be for us to approach him in the same way, to invite him only into areas of our lives that we deem “spiritual.” The trouble is, most of us equate “spirituality” with angels and church, not with everyday life. So it is no wonder that, as with the people of Nazareth, the Lord doesn’t work any miracles in our midst; we have no trust in him. Jesus taught his disciples that if they had faith the size of a mustard seed (check your spice rack to see how small a mustard seed is) they could do great things. But it is very likely that our faith, our trust in Christ isn’t even that big. We think we know Jesus, when in reality we know only our own image of him. It saddens me when someone who has been raised a Christian without actually embracing the faith experiences the power of God as an adult through some other means, often through a different faith community that is not united with the Church that Christ established while he was here on earth. The first apostles turned the world upside down, healing and preaching and raising the dead in the name of Jesus Christ. How is it that the power of Christ is not so easily recognized in our churches today? The Jesus that we encounter in the Gospels is amazing. Confronted with sickness, he heals the sick. Confronted with death, he raises the dead. Confronted with opposition, he silences his opponents. Then comes his Passion. Suddenly, with the exception of curing the ear of the high priest’s servant, Jesus reveals a different way of exercising his almighty power—through weakness! He accepts the cross, along with all the punishment and abuse thrown at him, until all is finished and he commends himself to the Father. After he rises from the dead, the only miracles recorded in the Scriptures are his ability to materialize and disappear from the midst of his disciples. What happened to the power Jesus exhibited during his ministry? He gave those powers to his disciples. Reading the Acts of the Apostles, you find the disciples of Jesus doing the very same things Jesus did in the Gospels, to the point of powerfully accepting death, exhibited in the stoning of Stephen. The history of the church is filled with examples of the power of Christ working through those who placed their belief in him. The stories that surround the saints tell of people being healed and of martyrs bravely facing death. Even in our own times, in the United States, there are shrines that exhibit crutches left behind after people were healed by the power of Christ. Our present time is one of unbelief. The modern church has become like the town of Nazareth. We think we know Christ, and as a result he can work no miracles in our midst. It is time to admit our ignorance of Christ. We should ponder the words, “Is not this Jesus, the son of Joseph, whose father and mother we know? How does he now say, ‘I have come down from heaven’?” (John 6:42). Is the Jesus we believe in the same Divine Person revealed to us in Scripture, or have we created a “kinder, gentler” version? Jesus says to us, “You know me, and you know where I come from. But I have not come of my own accord; he who sent me is true, and him you do not know. I know him, for I come from him, and he sent me” (John 7:28–29). Do we worship the Son of God of Scripture, or a false imposter, a pseudo-Christ? The Jesus rejected by men is the cornerstone of our faith. Without the real Jesus our faith is weak and powerless; with Jesus the Christ, we are powerful in our weakness. We become living stones—animated by the power of Christ, the Son of the all-powerful God. 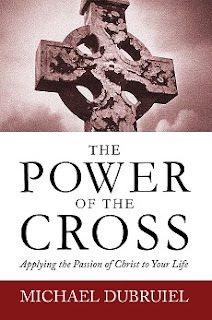 The Power of the Cross is a book well-suited to daily reading during Lent. The book is available here in pdf version. Daily excerpts will be reprinted in this space during Lent.